As I mentioned in my earlier post, I went to the opening night party for the Hello Kitty Three Apples Exhibition. If you are in Los Angeles, get yourself to the show at Royal/T Cafe before November 15, 2009. I went back on Friday and although I took another boatload of photos (see flickr sets here and here), for this post, I'm concentrating on the Food-related Hello Kitty items at the cafe and exhibition! 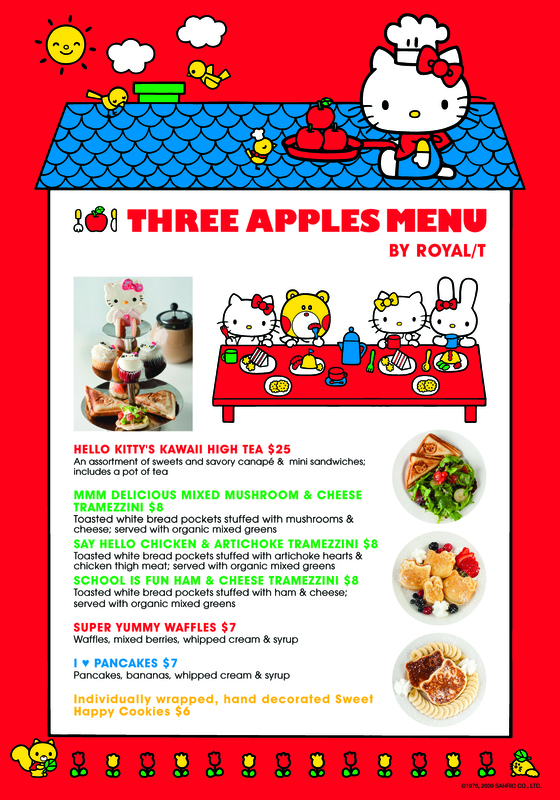 Royal T Cafe has a special Hello Kitty themed menu for the exhibition. My friend and I went for brunch on Friday. Royal T has a full tea menu...their mint tea uses dried and fresh mint. Delicious way to start the day! I ordered the Hello Kitty pancakes with berries, banana and syrup. My friend ordered the Say Hello Chicken and Artichoke Tramezzini. Savory, warm Hello Kitty sandwich. Hello Kitty on one side, and her friend the bear on the other! Filled with cheese, chicken and artichokes. Yum. The Royal T Cafe's special menu includes HK cookies, waffles, pancakes and sandwiches. A section of food related Hello Kitty items are on display...pasta, instant ramen, and cookies. Most items are from Japan. Between the wall of the cafe...many a stuffed Hello Kitty dolls are hanging out. Chillin'. The exhibit set up a Hello Kitty apartment, complete with kitchen. One of the rooms in the exhibit at Royal T Cafe. This one features items from Japan...including many food-related items. Hello Kitty as sushi chef! Miniatures! Too cute! This plate of pancakes is about the size of a quarter. Hello Kitty as Toast... part of the wonderful art show curated by Japan LA. See my Flickr account for many more works of Hello Kitty-inspired art! happy bday kitty! we just got back from my daughter's first bday party for a friend. at 6 month i was way more excited about the party favor, tons of hello kitty goodies!!! i have that sandwich maker! :) chicken and artichokes and cheese sounds so good.. i might have give that a try... and it's funny recognizing some of the HK stuff stuffed in my closet like the 7-11 figure giveaways.. I want to buy everything! Wonderful post. I didn't even know about this exhibit until reading your posts. I plan on visiting Royal T Cafe before the exhibit is over. Soooooo super duper CUTE! I love HK!